Paul's Fishing Kites carries a full range of kite parts and kite making supplies. Spars and struts made from fiberglass, composite rods and tubes and carbon fibre tubes to fit all of their kites. Hollow carbon fiber is the best in high stress parts of a kite because it is lighter and stronger than the other materials, on the downside carbon fiber rod for kites is the most expensive. 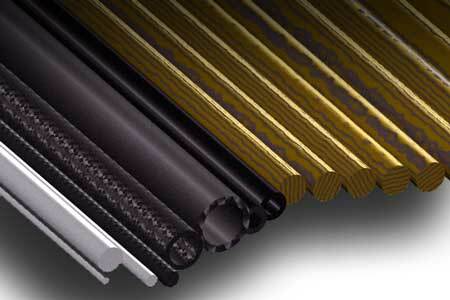 Composite kite rod and tubes are the next best because these materials combine a blend of carbon fibre and fiberglass. Solid fiberglass rods or tubes are relatively cheap but are much more flexible and are considerably heavier than composite or carbon fibre rods. *Note : Wooden kite spars made from hardwood like Tawa are light and relatively strong and we use them as cross spars and spreaders in our large delta kites. This is a safety feature as the wooden spars are weaker and will usually snap well before the more expensive internal fiberglass, composite or carbon tubes and rods. This minimises damage to the kite should it go into the water. Softer wood like pine and beech are too flexible to be used as safety spars and will make the kite unstable in gusts.